H ow to use: 1. Clean the surface, keep dry and get rid of the grease, rust. If does, wash with acetone or dip in the water, do not peel the glue by force. If getting in the eyes, wash with water at once then see the doctor for further steps. Shanghai Qiaoli Architecture Science Technology Co., Ltd.
We do private label for international brands around the world. We will be your reliable partner that you can cooperate for a long term business. 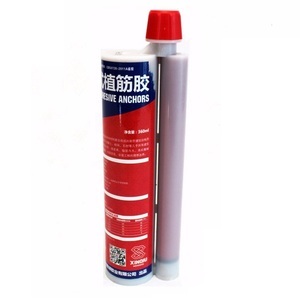 We produce varied materials and sizes of chemical anchors for meeting diverse market. 2. The drill hole must be cleaned with air blower, starting from the bottom of the hole. 4. Insert the anchor with a rotary motion into the filled drill hole. 5. 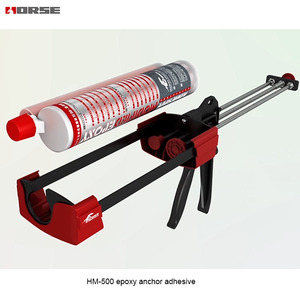 During the resin hardening time the anchor must not be moved or loaded. Shanghai Horse Construction Co., Ltd.
2.The drill hole must be cleaned with air blower, starting from the bottom of the hole. 4.Insert the anchor with a rotary motion into the filled drill hole. 5.During the resin hardening time the anchor must not be moved or loaded. 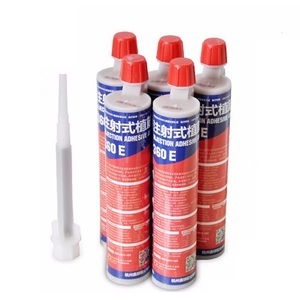 Guangzhou Rich Chemical Co., Ltd.
5.This curing process of adhesive is exothermic reaction , the adhesive quantity will affect the duration of operation, thus the operating time with 100 g adhesive is only a reference time. 2.Q:How to get samples 9 A: Normally,Sepna offer our customer 1-2pcs or 50-100g free samples for quality testing. Sepna can offer the customer OEM label service,and will give the protection of the your right in your market. Shandong Ruisan Chemical Technology Co., Ltd. 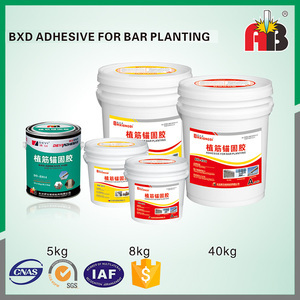 Product Index Application Area a) Waterborne epoxy sealing primer b) Waterborne epoxy concrete, mortar and putty c) Waterborne epoxy floor level d) Waterborne epoxy asphalt e) High solid content waterborne epoxy coating f) Waterborne epoxy adhesive, etc. mainly engaged in green and water based new materials such as waterborne epoxy series, waterborne epoxy resin, waterborne epoxy curing agent, special epoxy products, production and promotion, is a whole system of water-borne epoxy products provider. Q: What are your payment terms9 A: Normally, 40% deposit and balance T/T against copy of Bill of Lading or L/C at sight. 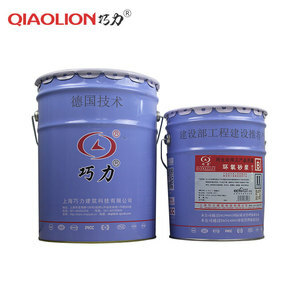 Liaoning Maiqi New Material Group Co., Ltd.
Main product: RQ303 Polymer cement mortar waterproof latex for building waterproofing Model Number RQ303 Brand Name Qinglong State Liquid Coating Application Method Brush Usage Appliance Paint,Building Coating Main Raw Material polymer Place of Origin China (Mainland) China (Mainland) Guangdong EINECS No. 79-10-7 Product Photo Company profile Qinglong mainly products waterproof membrane, thermal insulation material, and waterproof coating. We have successfully set up two systems: one is strict and scientific quality control system, and the other is prefect sales and after-sales service system. Anti-slip and strong hardness epoxy mortar floor paint Usage: Should be strong compression resistance, be suitable for the manufacturing shop of electric appliance, electronic, machine, food, pharmaceutical industry, tobacco industry, chemical, feed industry, textile industry, fashion industry, furniture industry, plastic industry, Stationery industry; Especially the way for forklift, car, heavy trolleys grind etc. 2, Weak acid resistant, weak alkali resistant,salt tolerance and erosion of the other chemicals; 3, Shrinked after curing, flawless. 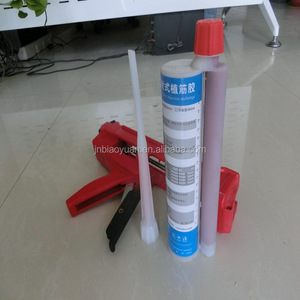 Construction process: 1,Base deal 2,Blush the sealing primer 3,Scrape the epoxy mortar 4,Scrape the epoxy sealing middle coating 5, Burnish and dust collection 6, Blush the epoxy top coat Technical parameter: Surface drying time: &le;4h Hard drying time:&le;24h Bonding strength: &ge;9Mpa Shock resistance:50kg. Beijing Bo Ao International Environmental Technology Development Co., Ltd. In case of quality problem, we can sign agreements and our company will perform the duties. 4. Q: Do you provide the free sample9 A: Free sample can be sent you for testing. 6. Q: Are you a factory or trading company9 A: We are a factory, and we have an international trade department. 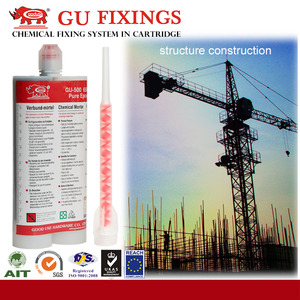 which need high impact-resistance,anti-corrosion and anti-abrasion Application features: high mechanical strength . arasion resistance,high-loading impact resistance. anti-slip. processing: clean the ground primer self-leveling middle coat color top coating (anti-slip processes) protecting if you Need more details. We do private label for international brands around the world. &diams; Any cerificat and pantent information, please feel free to contact us. Other Series Any question information please check or contact us. 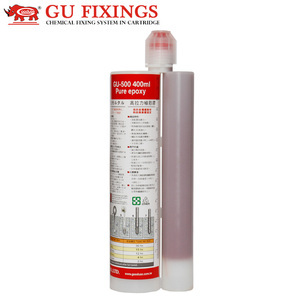 WE-8135 Waterborne Epoxy Curing Agent WE-8135 is a modified amine waterborne epoxy curing agent, which can be supplied in the form of about 53% water solution of solids, and is an environment-friendly waterborne green product. Q: What is the lead time9 A: 15 to 20 days after the receipt of the order. Q: What are your payment terms9 A: Normally, 40% deposit and balance T/T against copy of Bill of Lading or L/C at sight. 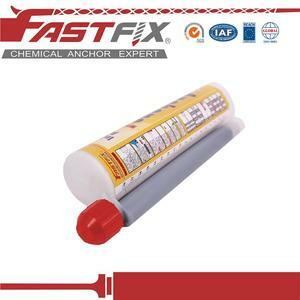 Alibaba.com offers 312 chemical epoxy mortar products. About 59% of these are adhesives & sealants, 12% are building coating, and 5% are road marking paint. A wide variety of chemical epoxy mortar options are available to you, such as free samples. There are 315 chemical epoxy mortar suppliers, mainly located in Asia. The top supplying countries are China (Mainland), Taiwan, and India, which supply 54%, 41%, and 1% of chemical epoxy mortar respectively. Chemical epoxy mortar products are most popular in Domestic Market, South America, and South Asia. You can ensure product safety by selecting from certified suppliers, including 247 with ISO9001, 18 with ISO14001, and 17 with Other certification.